Save Time, Cut Costs Effectively and Boost your Organization's Productivity. 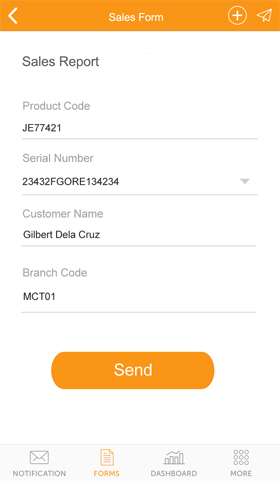 Registered users can access mobile forms and submit them via text for your data collection. They can also retrieve relevant information from your data source. Send and receive SMS messages via PC to phone or any device that supports SMS. Send different message types with prioritization group and batch sending. Create forms with customizable text fields to reduce the labor of time-consuming input of keywords to submit via SMS. Get dynamic data like account balances, daily sales report, repair status, leave credits and any data from your database. 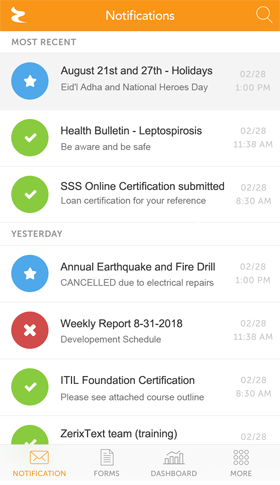 Users can access notification walls of their selected Zerix registered organizations like school, government, airlines, service and utility providers. Broadcast text alerts and reminders. For mobile marketing, safety and security alerts and important announcements. Add, edit, group, delete, block and import contacts with contact privacy. (Delimited file, Excel and Outlook). Sync contacts with an external database. Auto retrieve dynamic Info from your database & send a personalized response to your recipients. Be creative with the use of keywords! Automatic, Static/Dynamic message reply. Easily integrate with existing ODBC databases and applications. Have you missed important events? With Zerix Scheduler, you can send SMS at any time in the future with your chosen frequency. Create accounts for keyword admin or any user with customized access rights. Provide credit allocations or limit to control or restrict the number of messages sent per given time. Access your inventory, sales figures and other data through the use of keywords. Compatible with ODBC compliant databases. 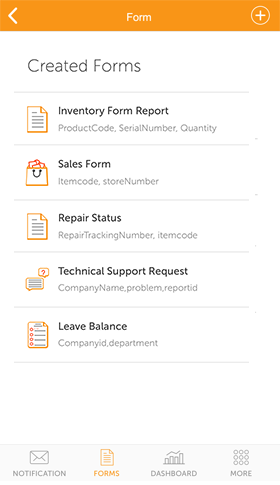 Automate tracking, data collection and create standard and custom reports. Text customers when they are ready to be served or advise them of their place in the queue. Push questions to gather quick response and gather data directly from your clients. Participants may text using keywords with voting options. Participants may register their mobile numbers to validate entries for raffle to ensure one mobile to one registration. Winner is automatically drawn. Access ZERIX Text over your network or over the web to send messages. Unmatched and comprehensive technical support and assistance. Facilitate faster decision-making by efficient transfer of important information via Text. any device that receives SMS data. It keeps records of all messages. improving your response rates to SMS and text inquiries. Facilitate easy communication with remote staff, empower your salesforce with on-hand information, monitor staff attendance and inform employees of meetings, activities and events. Update clients of your latest offers and inform them of their preferred products or services. Allow your clients to easily reach you and get their feedback and provide them with timely support. Get real-time information when inquiries are made via SMS or text. It works like an auto-responder. Get an instant response to your queries. "ZerixText allowed our staff to send SMS messages simultaneously using only 1 number. We no longer have to fall in line to use one mobile unit. With ZerixText, we can all use the same sim anytime. It also has other great features for sending SMS." "Our customer service hotline for all customer queries, concerns and claims now comes in the form of text. This is helpful because we are able to provide a more exceptional service compared to placing customers on hold. ZERIX has been more than helpful and we’ve used it for many years." "Honda Philippines launched a spare parts text promo. Using their mobile phones, our valued customers text in their names and text codes to join the raffle. They automatically receive a text message from Zerix Text which serves as their raffle entry. We are happy with the service that ZERIX Team has provided us." "Our company uses ZERIX to remind our clients of their renewals and their appointments with us. is a very useful communications tool for us and our clients." "ZERIX has helped us significantly reduce our inbound customer service calls. Our clients’ employees currently send us text messages to inquire about their claims and enrollment policies instead of calling us. We are now able to immediately reply to their concerns and attend to all their inquiries. I highly encourage the use of ZERIX Text for Insurance companies." How can you tell what is urgent when you have a flooded inbox? Emails, chats, social media messages can easily get ignored. ZERIX TEXT ensures that everyone gets your message on time. One-time Purchase of the Full ZERIX License. Free use of Zerix App for one (1) year. Enjoy upgrades and support for one (1) year. Maintenance Contract optional after (1) year. SMS fees or text charges are not included. Zerix Text only provides the software license. The cost of Zerix Premium Software License (please refer to ZERIX PREMIUM) is included. Php500 ( US$10 ) per additional user. The fee you'll be charged for sending SMS is dependent upon your rate plan with your service provider. ZerixText only provides the software application. One-time Purchase of the ZERIX License with Zerix App. ONSITE Training and Support will be offered to clients based in Metro Manila. For clients outside Metro Manila, travel & accommodation expenses will be billed to client’s account. Compatible with any Telco Provider. You may use any modem that can execute SMS-specific AT commands. Zerix Text can also connect to any Telco Gateway provider if the client is subscribed to a vanity number or short codes. Requires NO credit card and NO obligation. Demo trial is currently offered to clients based in Metro Manila. For clients outside Metro Manila, a refundable deposit of 30% will be required. Zerix is a product of Optimum Innovatus Corp. Trademarks, company names, product names, logos and product photos on this site are properties of their respective owners. ZerixText / Optimum Innovatus Corp., is an independent company and is no way associated or affiliated with any other company. you to access information, products and services. continuing product support. Our team provides the practical, intuitive and innovative solution that will fit your expectations. We are genuinely committed long-term to client satisfaction. IMPORTANT - READ CAREFULLY: This ZERIX Software License Agreement (“License”) is a legal agreement between you (either an individual or a single entity) and Optimum Innovatus Corp. (“Innovatus”) for the licensing of software products from Innovatus. DO NOT DOWNLOAD, INSTALL, COPY OR USE THIS SOFTWARE UNTIL YOU HAVE READ AND ACCEPTED THIS LICENSE. BY DOWNLOADING, INSTALLING, COPYING, OR USING THIS SOFTWARE, YOU AGREE TO BE BOUND BY THIS LICENSE. IF YOU DO NOT AGREE WITH ANY TERM OR CONDITION OF THIS LICENSE, INNOVATUS IS NOT WILLING TO LICENSE THE SOFTWARE TO YOU. IN SUCH EVENT, YOU MAY NOT DOWNLOAD, INSTALL OR USE THE SOFTWARE. YOU MAY, HOWEVER, RETURN THE SOFTWARE (INCLUDING ALL ACCOMPANYING MEDIA, DOCUMENTATION, PACKAGING AND MATERIALS) IN AN UNDAMAGED CONDITION TO THE VENDOR FROM WHOM YOU ACQUIRED IT WITHIN 10 DAYS FOR A REFUND OF THE FEE, IF ANY, YOU PAID FOR THE LICENSE. This License governs ten (10) day evaluation licenses as well as all other licenses applicable to Innovatus products. There is no fee for an evaluation license; all other licenses must be purchased from Innovatus or its authorized resellers. Except as otherwise expressly provided herein, this License will also govern any Software updates and upgrades that may be provided to Licensee in accordance with Innovatus’ then-current maintenance and support policies, unless such updates and upgrades are provided under separate license agreement. ANY OTHER SOFTWARE THAT MAY BE PROVIDED WITH THE SOFTWARE THAT IS ASSOCIATED WITH A SEPARATE LICENSE AGREEMENT IS LICENSED TO YOU UNDER THE TERMS OF THAT LICENSE AGREEMENT. License. For purposes of this License, the term “Licensee” means the person, company or entity that uses the Software under this License. The Licensee must accept and agree to this License before downloading, installing, copying or using the Software. You may not reverse engineer, decompile, or disassemble the SOFTWARE, except and only to the extent that such activity is expressly permitted by applicable law notwithstanding this limitation. Software and Documentation. “Software” means the computer programs of the licensed software product(s) in the form and version(s) provided to Licensee, together with the associated media and corresponding Documentation. “Documentation” means the end user manual and other documentation (including print and “online”), if any, provided to Licensee with the Software. Ownership. All title and intellectual property in and to the Software (including all copies of the Software made by Licensee) are owned by Innovatus and its licensor(s). The Software is also protected by copyright law and other related intellectual property rights. The Software is licensed to Licensee, not sold. Activation Key. To use the Software, Licensee must first obtain an “activation key” from Innovatus or its authorized reseller. The activation key may be a printable digital key, a non-printable file, or any other mechanism used by Innovatus for license activation purposes. License. Subject to the terms and conditions of this License, Innovatus grants to Licensee a nonexclusive, nontransferable license to use the Software. Licenses apply separately to each Software product. However, a special type of license can be seen the form of a product or package label or confirmation e-mail will be sent to the Licensee and will identify the Software licensed to Licensee under this License for a limited and restricted use. Evaluation License - An NFR Demo license is a special type of “limited user” evaluation license that is provided exclusively to, and for use only by, Innovatus channel and OEM partners to assist in demonstrating Innovatus’ software to prospective customers. In the event the partner relationship with Innovatus expires or is terminated, or the Partner no longer uses the license as intended, the NFR license will immediately terminate. Not for Resale (NFR) Demo License - An Evaluation License is a “limited time,” “limited user” license that provides the Licensee an opportunity to try the Software before buying a full license. A temporary activation key will be issued to Licensee for this license. The Software may only be used for evaluation purposes. The Software is licensed to Licensee only for the specified evaluation period, which will begin on the date that the Software is first downloaded by or delivered to Licensee. Technician and Consultant Licenses - Technician and Consultant Licenses are sold on a “per-individual” basis. Each license is restricted to a single individual (the “technician” or “consultant”) who is an employee or independent contractor of Licensee, and may not be transferred to or shared with any other individual. Licensee guarantees the technician’s compliance with this License. Use of the Software is limited to use by the technician (if an employee) within his/her scope of employment with Licensee, or use by the technician (if an independent contractor) within the scope of his/her services for Licensee. One Technician or Consultant License must be purchased for each technician involved in setting up, installing, imaging or configuring any managed computers. The computers on which the licensed technician uses the Software are Licensed Computers. Technician and Consultant Licenses do not allow any element of the software to be “left behind” on the Licensed Computers once the configuration tasks have been completed. Copies. Licensee may make copies of the Software provided that any such copy: (i) is created as an essential step in the utilization of the Software on a Licensed Computer and is used in no other manner and on no computer which is not a Licensed Computer for that Software, or (ii) is only for archival purposes to back-up a Licensed Computer. All trademark, copyright and proprietary rights notices must be faithfully reproduced and included by Licensee on such copies. Licensee may not make any other copies of the Software. If obtained for evaluation purposes, at the end of the evaluation period, Licensee must erase all copies of the Software unless a license is purchased as provided above. Restrictions. Innovatus reserves all rights not expressly granted to the Licensee. Without limiting the generality of the foregoing, Licensee shall not: (i) disassemble, de-compile or otherwise reverse engineer the Software, or (ii) create derivative works based upon the Software, or (iii) rent, lease, sublicense, distribute, transfer, translate, modify or reprogram the Software, or (iv) timeshare the Software, make the Software available to others on the Internet, any BBS or any on-line service, or allow others to copy, access or use the Software. Limited Warranty. If (a) the Software does not substantially conform to its specifications in the Documentation, or if the physical media accompanying the Software is defective, or if Licensee is dissatisfied with the Software for any reason, and (b) if the Software (including all accompanying media, Documentation, packaging and materials) is returned by Licensee within 10 days of first receipt, then the payment made by Licensee to purchase the license shall be refunded to Licensee. Upon return, the License shall terminate and Licensee must immediately cease all use of the Software and remove and erase all copies of any Software from all computers and storage media and devices within the possession or control of Licensee. At Innovatus’ request, Licensee will certify in writing to Innovatus that Licensee has complied with section. In the event that the Software is licensed under an Evaluation License, there shall be no refund because an Evaluation License is free. In the event that Licensee purchases a Software license during or after evaluation of the Software under an Evaluation License, then there shall be no obligation to refund the payment made by Licensee to purchase the Software license (i.e., the 10 day evaluation period was Licensee’s 10 day limited warranty period). THIS LIMITED WARRANTY SHALL NOT APPLY TO SOFTWARE UPDATES AND UPGRADES. ALL UPDATES AND UPGRADES ARE LICENSED “AS IS,” WITHOUT WARRANTY OF ANY KIND. Disclaimer of Warranties. INNOVATUS MAKES NO WARRANTY NOT EXPRESSLY SET FORTH IN THIS LICENSE. EXCEPT AS EXPRESSLY WARRANTED ABOVE, THE SOFTWARE IS PROVIDED “AS IS,” WITHOUT WARRANTY OF ANY KIND. INNOVATUS DISCLAIMS AND EXCLUDES ALL IMPLIED WARRANTIES, INCLUDING, WITHOUT LIMITATION, THE IMPLIED WARRANTIES OF NON-INFRINGEMENT, MERCHANTABILITY AND FITNESS FOR A PARTICULAR PURPOSE. ANY EXPRESS WARRANTY MADE OUTSIDE OF THIS LICENSE IS EXCLUDED AND SUPERSEDED. INNOVATUS DOES NOT WARRANT THAT THE SOFTWARE WILL SATISFY LICENSEE’S REQUIREMENTS OR THAT IT IS WITHOUT DEFECT OR ERROR OR THAT THE OPERATION THEREOF WILL BE UNINTERRUPTED OR ERROR FREE. Limitation of Liability. THE AGGREGATE LIABILITY OF INNOVATUS ARISING FROM OR RELATING TO THIS LICENSE OR USE OF THE SOFTWARE (REGARDLESS OF THE FORM OF ACTION OR CLAIM, SUCH AS CONTRACT, WARRANTY, TORT, STRICT LIABILITY, MALPRACTICE, AND/OR OTHERWISE) SHALL NOT EXCEED THE AMOUNT OF ALL LICENSE FEES PAID BY LICENSEE FOR THE SOFTWARE LICENSE(S) GRANTED HEREUNDER. INNOVATUS SHALL NOT IN ANY CASE BE LIABLE FOR ANY INCIDENTAL, CONSEQUENTIAL, INDIRECT OR PUNITIVE DAMAGES, OR FOR ANY LOSS OF PROFITS OR REVENUES, OR FOR LOSS OF COMPUTER PROGRAMS OR DATA, REGARDLESS OF THE FORM OF ACTION AND EVEN IF ALTIRIS HAS BEEN ADVISED OF THE POSSIBILITY THEREOF. Associated Software. There may be software required to be downloaded and installed prior to successful installation and use of this Software. The software included in this product contains copyrighted software that is licensed under the GPL. A copy of their license is included in the associated software prior to downloading. 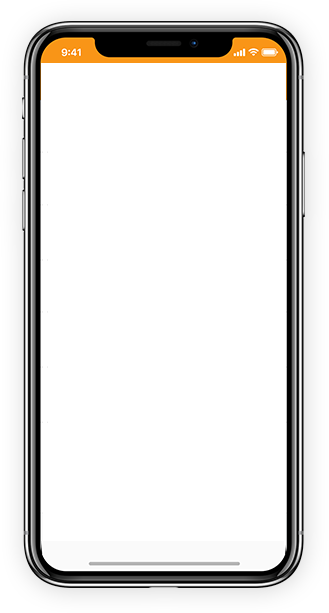 company server or personal computer to a phone or any device that uses SMS. What devices do I need to operate Zerix Text software? and the Zerix Text software. Where can I use Zerix Text software? What are the key features of Zerix Text? Is it hard to use or navigate? I am not a techie person. sending a text message from your phone. Can your technical staff access our contacts, messages and databases? contacts or data. This is an offline software. Do I need to have internet connection for this system? Yes, a SIM card is required. Please purchase a SIM from your chosen mobile carrier. If I am in another country, can I use that local SIM Card of that country where I am at to run the system? How many SMS’ can I send? sim card to send unlimited text messages so you can maximize the use of your Zerix Text software. How long will it take for SMS to be sent out using Zerix Text Software? This will depend on the mobile signal and network coverage. Normally, Zerix text can send 15 messages per minute. If there are unsent messages, will we be able to see them? Yes, you can check the outbox page for the unsent messages. during all locally observed holidays. Reinstallation in case of system upgrades limited to one (1) server and (1) client workstation per license. Keyword set-up or data integration or migration. Any customization request may be added for a fee and the extent of customization and level of support will be at the discretion of Optimum Innovatus Corp.